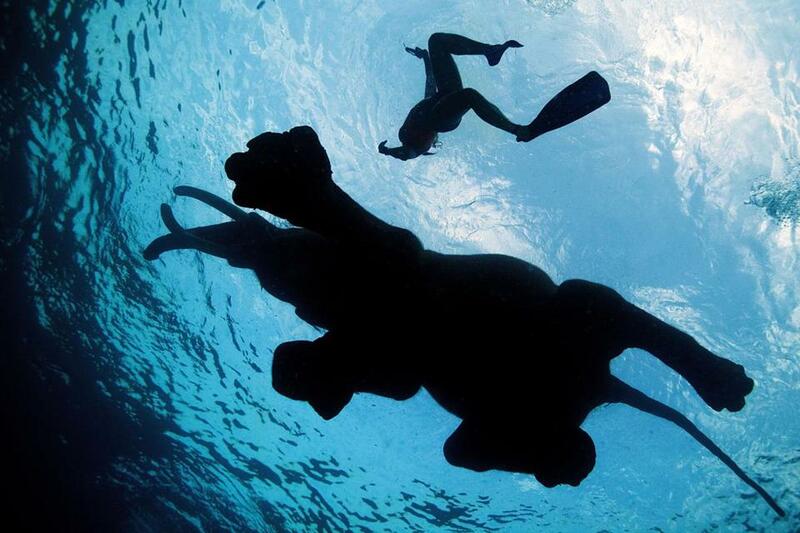 A 63-year-old Indian male elephant, nicknamed Rajan, swam with people near India’s Andaman Islands in 2013. Twenty-five years ago in Kenya, my wife stepped to the veranda railing of a jungle lodge and began speaking softly to a family of seven or eight elephants clustered at a watering hole about 15 feet below. After a few minutes, an adult male separated himself from the pack and walked toward us. As he moved closer, dozens of uneasy guests drew back from their luncheon tables. My wife remained calm at the railing, directing her words of welcome toward the approaching creature. Slowly and lovingly, it seemed, the elephant lifted his trunk and placed it on her left shoulder. Their communion lasted several minutes. The image of their bonding has burned in my memory for a quarter century. Humans have always had close relationships with elephants and the more we learn about them, the more warranted our affection for them appears to be. Indeed, there is much that we can learn from their family traits and courtly behavior. After all, elephants have the largest brain in the animal world, averaging 11 pounds. Little wonder then that elephants have attracted the admiration and curiosity of human beings for thousands of years. Modern science has vastly improved our understanding of these creatures, but writers and historians have chronicled their human characteristics for centuries. In 218 B.C., Hannibal’s army drove a herd of 40 elephants across the Pyrenees and the Alps into an epic battle with Imperial Rome. All but one of the giant creatures perished. Sadly, the use of elephants in combat continued into the Vietnam War. In the 1930s, however, a Frenchman, Jean de Brunhoff, captured a different side of elephant behavior. Enchanting children (and their parents), he wrote seven books about Babar, a fictional elephant. De Brunoff’s son, Laurent, continued the series, which spread to Britain and the United States. A decade later, “Dumbo” became a huge animated hit for Disney, with serious staying power: This spring, the studio announced that Tim Burton will direct a live-action remake of the film. 2013: Should chimpanzees have legal rights? The “animal personhood” movement believes dolphins, great apes, and elephants deserve to be able to sue — and now it has a plaintiff. I read Babar’s stories to my young daughters in the 1970s and “Horton Hears a Who,” too. We absorbed a message: Elephants fictional and real lead complicated lives yet retain values of loyalty and the kind of steadfastness we all admire in humans. In the wild as well as in game preserves, elephants nurture and educate their young. Their progeny learn to respect their parents. In a chance meeting of elephants on a jungle trail in Thailand, my wife and I watched a young, fully grown elephant politely refuse to proceed up a path until her mother led the way. Just how similar are elephant perceptions to our own? One widely cited study found elephants capable of discerning themselves in mirrors, a rare act among animals. Without interrogation, of course, it’s hard to say whether they suffer fits of vanity like us or mere curiosity about themselves. Still, in dozens of studies and experiments dating back decades, behavioral scientists have discovered and verified traits that mirror our own responses. One experiment by Dr. Frans de Waal of Emory University and Dr. Joshua Plotnik of Cambridge University turned up clear evidence of elephants attempting by sounds and touch to reassure their fellow elephants suffering from stress. There is reason to hope that answers to our questions about elephants will not remain locked away behind a language barrier. While barely audible, dozens of sounds shared between elephants suggest a narrative that someday may be fully translated. Researchers show no sign of giving up attempts to understand elephant communications. One source of our more recent fascination can be traced to an extraordinary tale circulating on the Internet: Soon after the death of a beloved longtime human protector, a small South African herd of elephants traveled — apparently without human direction — to visit his home, where they remained for two days without eating, then returned to their habitat miles away. For now, most of our exposure to elephants comes from the written word and photos, and not all evoke the attractive qualities of Babar and his family. Behavioral scientists have discovered and verified traits in elephants that mirror our own responses. In no fewer than three commercial movies dating back to the 1920s, “The Elephant Man” features a character with crudely disfigured face and grotesque head. Even in a hostile setting, however, the title character evokes a measure of sympathy. More often, there are endearing reminders of our fondness for our mammalian friends. Recently in a friend’s apartment, I spotted a print of the painter Man Ray’s exquisite line drawing labeled “Elephant.” With just four wonderfully simple strokes of his brush, the surrealist artist captured all the simplicity and charm of a species from which, if we pay attention, we cannot fail to learn lessons of life. Our favorite lesson, of course, is what we saw as a habit of acknowledging each other’s presence, something my wife and I first recognized so many years ago on that veranda in East Africa. John Martin is a retired ABC News national correspondent. • How many animals are really going extinct? 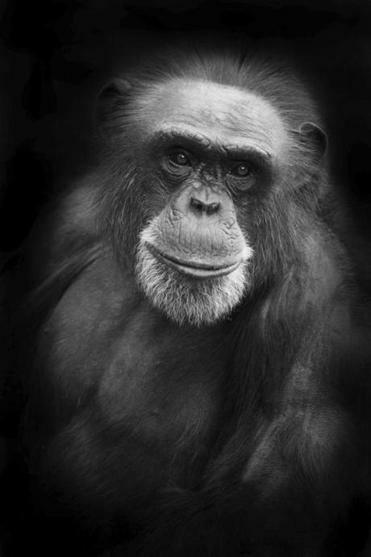 • 2013: Should chimpanzees have legal rights?